June’s issue of Atlantic Monthly brings to the reader a series of graphs as presented by Derek Thompson’s “How the Rich Shall Inherit the Earth”. The article gives a pictorial representation of what has taken place since the eighties in skewing income to a small, very small group of individuals numbering < than a hundred thousand taxpaying households. The bulk of the ~1 % are much like the 99% and make their income mostly from wages. It is the 1% of the 1% who have excelled in making their money from investments and inheritances. There are quite a few discussions going on at various blogs as to whether r > g or not and whether it is a fundamental law of capitalism/economics. Side comment; FIFA governs soccer games utilizing the laws of the game which are open to interpretation by various referees monitoring the game. Laws are not rules and are open to interpretation. Courts also give interpretations of laws, which can be superseded by higher courts. When various district federal courts disagree, SCOTUS can and may make an interpretation. There does not appear to be such a governing body in economics the same as FIFA or SCOTUS.. In my opinion, this result is not a natural state of being and it is the result of manipulation. In a series of charts, Thompson has captured what Piketty has said in 700 pages(?) and the result of the skewing of income to a minority of taxpaying households. 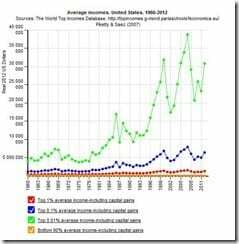 – Since the late seventies, income growth among the top 1 percent of Americans has outpaced the income growth of the other 99%. In further examining the 1%, it is the top 1% of the 1% which has experienced the greatest growth. – Adding to his earlier comment; “the richer you are, the more likely it is that your wealth came from stocks and not income from payroll wages. Most people want to believe they are capable of achieving great wealth resulting from their labor and the wages paid for it. Wages resulting from Labor “are less relevant to earnings at the top of the income pyramid”. Taken from: Economic Policy Institute, “‘The State of Working America 2011, Share of Stock Holdings Held by Top 10% Has Barely Budged in Last Two Decades.’ Includes direct ownership of stock shares and indirect ownership through mutual funds, trusts, IRAs, Keogh plans, 401(k) plans, and other retirement accounts. well o.1% is not 1% of 1%, so which to you mean? i would be the first to agree that high concentrations of wealth are dangerous for a country. but to say that such concentrations are natural is not to side with the enemy. the fact (alleged by me) is that the nature of capitalism/free enterprise is for money to drift into the hands of those who already have most. the fact that it is natural doesn’t mean we shouldn’t do something about it. to save the capitalists from themselves if not to save the rest of us from them. that money collecting in stagnent pools at the top is not only dangerous politically, but it is dangerous economically. maybe we need to make clear that one of the functions of government is to recirculate money. and just to make you all mad at me…. i do not think there is necessarily anything bad about “inequality.” the fact (alleged by me) is that with excessive inequality the very rich take control of the government and the economy and then you get predatory capitalism, and that is bad. i think we need to focus on what is bad and not just indulge in a “hate the rich” group venting. there are some honest rich… and of course some really nasty rich and rich wannabes…. but it pays to pay attention to the bad behavior and not just the label “rich” which begins to sound to my ear like some other labels we have heard in history. 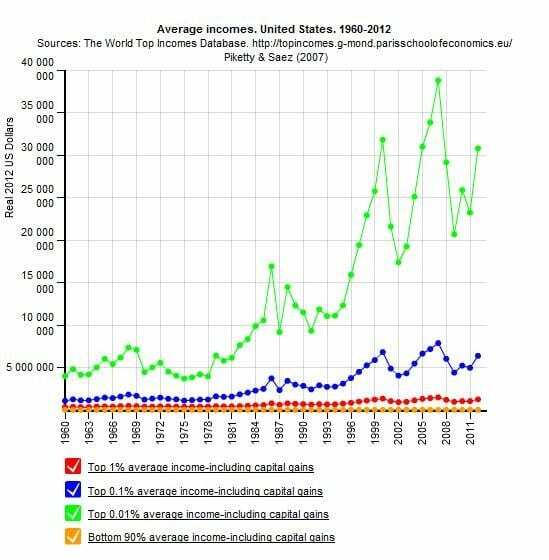 What is most interesting, is that share of income from wages is peaking just after this for the top 5%. 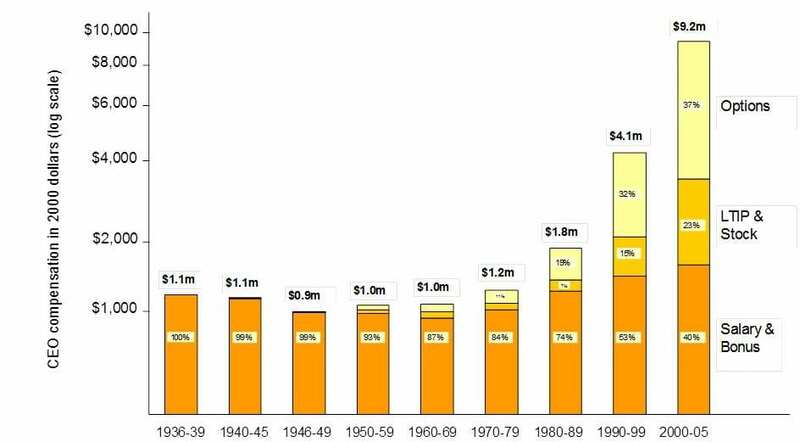 The 95 to 99 group at 76.4 in 1983, the to 1% at 66.1 in 1984 and the top 0.1% at 53.9 in 1984. Only the top 0.1% see an greater peak after this and it’s in 2000 at 58.2 % of their income from wages. Income from rents and dividends decline from the mid to late 20′s until rent income starts to rise in 88/89 and dividends income changes direction in 2000. For the 90 to 95 group we see their income coming from dividends (1.5 rise to 1.9) and rent (.03 rise to 1.2). Are we seeing the effects of investing in 401K’s and real estate? Interest goes down from 2.1 to 1.8% of total income. The 95 to 99 group is the same. Dividend rise from 3.2 to 4.7 and rent from 1.8 to 2.2 with interest income declining from 3.9 to a low of 2.9. Even the top 1% is similar. Dividend income rises from 4.2 to 6.6. Rent rises from 2.5 to 2.7 and interest declines from 5.1 to 4.8. Income from interest is at it’s lowest in 2004 for all 3 groups. But, when we look at the top 0.1% we see the greatest rises here. Dividends goes from 5.2 to 10. Rents don’t rise as great as the lower 2 groups going from 2.9 to 3.1. However, interest income does the opposite of what we saw, it rises from 6.7 to 7.1. The other groups fell. The key to the puzzle I believe is in the income from entrepreneurship and the amount of income in the top 1%. For the lowest 2 groups income from entrepreneurship rises. 5.0 to 7.4 in the 90 to 95 group, 18.9 to 21.5 in the 95 to 99 group. The top 1% has a healthy change from 26.5 to 29.1, but the top 0.1% only rises form 31.3 to 35.1. As a % change this is the smallest. …. It appears we have a transition from trying to increase income via work through entrepreneurship and real estate to more passive income of dividends to just plain playing it safe with interest when you have income that puts you in the stratospheres (about $5.5 million per year) as oppose to the $96K entry fee to the top 10%. Do you consider CDOs, tranched MBS. CDS, and naked CDS safe? Unlimited Wall Street investing by TBTF banks, safe? Banks are safe as long as Main Street backs them up. We have basically insured Goldman Sachs and other investment firms from failure by making them banks. I would not call the aforementioned investments unsafe as there is still little transparency to them and little reserves set aside. It is still business as usual. It is here the .1% and .001 percent have excelled in making their money with much of it being taxed at lower Capital Gains rate. In 2007 I was only making a comment that the top was not earning their money from labor, nor even that variant of labor: entrepreneurship. In 2007 I was pointing out what was my initial theme: We had changed the economy from making money from labor (physical or cognitive) to making money from money and that this was the cause of the income inequality. In the BLS data and Saez’s data there was no further defining what “vehicles” the top was using for their savings. It was just savings. Also, I was generically referring to the “safety” of savings as savings had always been considered the safer money. We’re talking 5/18/2007 over a year before the crash and the alphabet soup of “investment vehicles” became a suspect in the crime. If I can find it, I will link to a post I had on the Japan Ministry of Finance report on how the vast majority of the US corp earnings via off shoring were actually rent collecting via royalties. This post was based on writings Stormy had here at AB. Though I might have put it in a comment to one of his postings. Just another vehicle being pointed out as to how the top was managing such income growth inequality. All of this culminated in the fact that the top was extracting income out of our economy faster than we could produce it. Something I have found no evidence for having existed in the past and have yet to read any economist of authority making the connection. And, that is the actual mechanical money flow fault that we are still yet experiencing. It is not just the growth of the inequality, it is that the top’s income is growing faster than the economies are growing that has impoverished the middle classes of the world. That the top has also changed the rules so that risky “savings” vehicles are now safe via the “good faith and credit” of the USA to tax it’s citizens was not something I was thinking about then, nor do I believe was anyone else. Up until the collapse, Greenspan was still believing (believing is the correct word) in the invisible hand of the market “Too big to fail” as in so big that even the USA is afraid of you (even though the USA is far more economically powerful) I don’t think was being considered in the general dialog involving the economics of income and growth. Even those from banking who pushed to have such policies that created such insurance were not certain they could pull it off until the actual bailout happened. Precedent set. We can thank AG Holder for the concept of saving the corp so that you don’t hurt the innocent as to why the “too big to fail” fallacy is now accepted. It totally ignores the fact that the work that the failed company was doing would still be required within the economy and thus other corps would pick up the labor as they picked up the work left by the failed corp. This of course assumes the work was something of real value and not simply a banking alphabet soup “product” created to make more money from money. Though, we still have those “products” still making money don’t we. Since when do conservatives go for the hippy dippy “natural is good” argument? Dying of smallpox is natural. Is it good? Cannibalism is natural? Is it good? Corporations are government created entities. Where are the conservatives arguing that they are unnatural examples of government intervention in the economy and therefore evil and must be abolished? From Nebuchadnezzar to the Hapsburgs, kings and queens, lords and ladies have held concentrated wealth, while the Ordinary Peasant sucked on it and mostly did without. There was NO value in “trickle down” then, there is NONE now. Democracy IS the stepping away from that kind of thinking and NOW is the time to get with the program. AND YES INDEED TAXATION IS the way to solve that problem, governments do it ALLL the time. Worried about interfering with the “natural way capitalism works. ?” Natural/smatural; they are just worried about conforming to their theories of how it supposedly works. Lately, after reading Ha-Joon Chang’s “23 Things They Don’t Tell You About Capitalism” — added to — my own commons sense observations on the minimum wage which don’t seem to have anything in common with the “last marginal utility” crowd (anything at all) — I am beginning to see that the unfettered free market theories belong right up there with Marxist theories for LOGICAL PLAUSIBILITY (overwhelmingly plausible apparently or so many people wouldn’t wreck their economies over them) that simply don’t work in the real world (think Marxism). Chang notes that the economies that have taken off — Korea, the Asian Tigers, China — are all run by lawyers and engineers. Those run by economists — India, South America — are huge messes. Point may be: don’t pay any mind to the last marginal utility crowd and their undergraduate entertaining theories at all — be lawyer, an engineer — just pay attention to day to day market conditions. The policies are not flawed. Capitalism is a flawed. Capitalism is only natural in light of survival of the cunning indiviual. Man is different than the lesser being because man organized and united for a common good. Capitalism is a few taking larger share of the common good. Avarice is not virtue, neither is it moral for many to starve (forgo health care) while some own everything. Why Mao got to where he did………………. If r > g is absolute law then the system is not viable. Yves’ comment is very strange to me. Saying that r>g does not commit you to saying that “large and growing inequality is a state of nature.” Nothing about capitalism is a state of nature. It seems to me that Yves’ real concern is that saying r>g surrenders to the narrative, advanced by various market fundamentalists, that market outcomes are uniquely fair because market transactions are always voluntary and do not involve coercion. But their claim is basically just BS. One market in particular has coercion as its centerpiece, the labor market. A person may not have to take any particular job, but s/he has to take some job or not eat, etc. Lindblom’s *Politics and Markets* gives more examples of economic coercion, including my favorite one from a research standpoint, site selection and plant closures. To say that r>g just says that the unregulated market creates increasing inequality. So, as Piketty argues, you regulate market outcomes by taxing wealth. I don’t know if r actually is greater than g, but if it is it’s no surrender for progressives. We need to be fighting against the “markets are fair” narrative anyway. I believe Piketty reasoning is r>g is ironclad. Most of the discussion points I read in the thread were that it is not. I believe Yves is saying is r>g is such than the accumulation of wealth by the .001% is natural and not something which has been the result of policy such as the 2001/2003 tax breaks which skewed massive income tax breaks to the wealthy. That is not natural and in the end, they were the only ones to have escaped the 2001 recession (the impact of which lingered) seeing a loss. Well I think Yves is missing the point. The reason that R>G in a capitalist dominated politico-economic system is that capitalists demand that it be so. But in a truly representative democratic this demand can be limited and indeed Picketty suggests a mode of action to do so in his global wealth tax. Now we don’t have to endorse Picketty’s specific proposal to accept his general point that we can control R without totally suppressing G. Which is what the opposition is denying is even possible. Now it may well be that it is neither possible or even desireable to reduce R right down to the level of G without removing the incentive to invest rather than consume surplus capital. But that doesn’t mean surrendering the field of battle to Capital. Instead it suggests adopting our own version of the Laffter Curve (the Picketty Curve?) exploring the sweet spot to limit R while not burdening Sustainable G. (Because G for G’s sake is itself a conceptual error, the world and its basic resources only being so big). Or I might have saved pixels by saying “What Kenneth said” and left it at that.